FILE - А мicrobiologist reads a panel to check on a bacterium's resistance to an antibiotic in а lab at the U.S. Centers for Disease Control and Prevention, Nov. 25, 2013, in Atlanta, Georgia. More than 80 international drug and biotech firms urged governments to work with them to combat drug-resistant superbugs that could kill tens of millions of people within decades unless progress is made and new antibiotics found. In a declaration at the World Economic Forum in Davos, which opened Wednesday, the firms called for coordinated efforts to cut unnecessary use of antibiotics and support development of new ones — including through changing drug prices and investing in research. Any use of antibiotics promotes the development and spread of so-called superbugs — multi-drug-resistant infections that can evade the medicines designed to kill them. 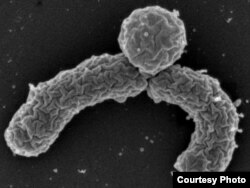 International alarm about the superbug threat is rising after the discovery in China of a gene called mcr-1 that makes bacteria resistant to all known antibiotics. "For the world to continue to have new antibiotics, we need investments in basic science and novel incentive models for industry R&D, and to protect our existing treatments, we need new frameworks for appropriate use," said Paul Stoffels, chief scientific officer of Johnson & Johnson. In his initial report, he estimated antibiotic and microbial resistance could kill an extra 10 million people a year and cost up to $100 trillion by 2050 if it is not brought under control. While the problem of infectious bugs becoming drug-resistant has been a feature of medicine since the discovery of the first antibiotic, penicillin, in 1928, it has grown in recent years as drugmakers have cut back investment in the field. They also promised to increase investment in research and development "that meets global public health needs" and work to ensure affordable access to antibiotics all over the world, at all levels of income. Britain's chief medical officer, Sally Davies, said the declaration was "a clear sign of industry's collective commitment to beating the threat of antimicrobial resistance." "I look forward to seeing an advancement of discussions between companies and governments on how we build new and sustainable market models that properly incentivize the discovery and development of new antibiotics, whilst ensuring affordable access to these crucial drugs for all," she said.